1) Excellent instruction guides for planting, fertilization and other topics are found here (look under Product Info on the right). Mike Noel of Lewiston, Idaho writes: I tried some synthetic bailing twine (any cord or twine will work) with a loop and cord lock closure. These were cheaper than the big wire ties and are reusable as well as removable. The cord locks can be found on eBay for about than 15 cents each including shipping. This idea seems to of worked very well. Survived a couple of storms without any sign of failure. Mr. Victor Patel of Florida is creating a Global Buckets project for a school in Lusaka, Zambia. Mr. Patel saw that we drilled the overflow/air hole 3 1/2 " from the bottom of our 5-gallon Home Depot bucket in our video, Build a Global Bucket. The problem is that when he drilled the hole 3 1/2" from the bottom of his 5-gallon Home Depot bucket, it created a 0" air gap between the buckets. Mr. Patel asked if we had used a spacer of some type. a) Maybe the buckets are different. These buckets are from early 2009, left over from a science fair experiment. Maybe Home Depot uses different factories from different parts of the planet, each with slightly different shapes and sizes. c) Different air space. In the video, BUILD a Global Bucket, we created about a 1/2" air space below the upper bucket. An 1" air space would have been better. d) If you take a close look at the video, you'll see that I'm holding the ruler about 1/4" below the bottom of the bucket (Oops!). The bottom line is to place the hole so that it provides about 1" of air space below the bottom of the upper bucket. In our video, BUILD a Global Bucket, we're using 18 oz Kirkland Chinet Premium Heavyweight plastic cups purchased from COSTCO . The 3 1/2" hole saw makes a perfectly sized hole for the 18 oz cup. A 16 oz cup should work fine, but you'll need a smaller hole saw. If you're using our automated watering system (see the videos) make sure the buckets are on the same level ground as the reservoir. We had our buckets and reservoir on a sunken patio which had an "invisible to the naked eye" 1/4" per foot drop. The main reservoir was eight feet south of the buckets. This resulted in the bucket's water level two inches too low. Ooops! 1" White PVC Fill Tube? 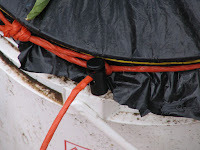 Robert Pait asks if you still need the white 1" PVC fill tube if you're putting the black 1/4" poly fill tube through a hole on the side of the bucket like we did in our irrigation videos. In new buckets we are putting in the PVC fill tube. The reason is that if you put the 1/4" poly fill tube in a side hole and then you attach weights to the 1/4" poly tube like we did in the video, then it's impossible to move the bucket. Now we put the 1/4" poly tube down the white PVC fill tube. This way you can easily move the bucket if you need to. 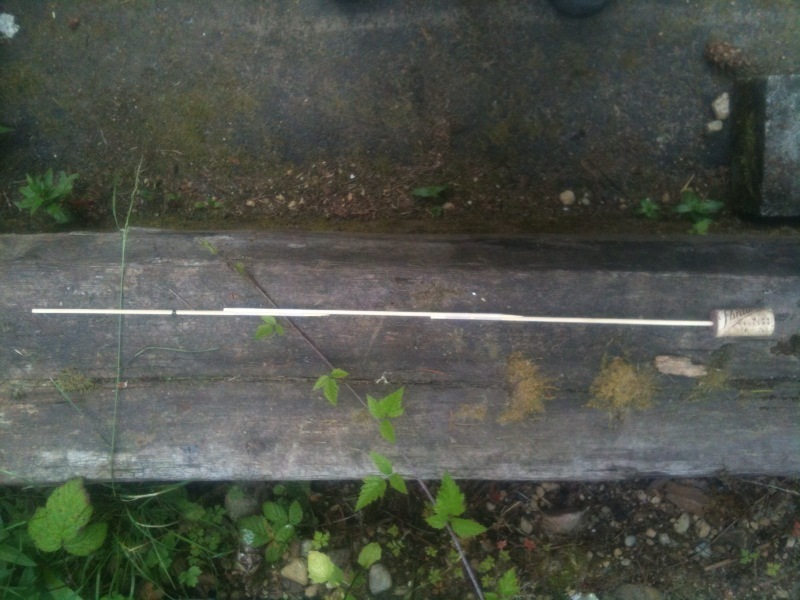 Also, it's nice to be able to check the water level of the reservoir by sticking something like a cork attached to a long thin stick or wire into the PVC tube. A reader wondered if the possibility of plastic leaching from a bucket is a health concern. We do not express any opinion on this question, but if you do have concerns you may want to use "food grade" buckets (buckets that once held food in them). 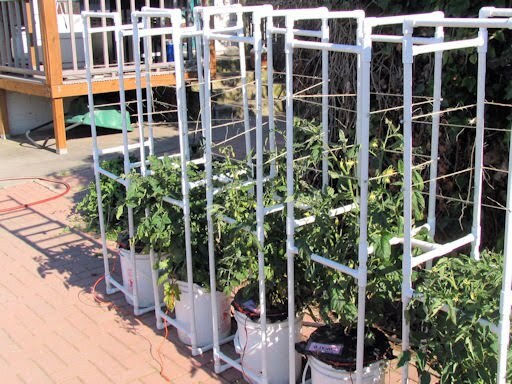 A viewer from YouTube (jj8a) questioned if root disease could transfer from one bucket to another bucket via the 1/4" tubing in the automatic watering system. This is a great question. To be honest, we don't know the answer. We don't think water or a disease would migrate from the end of one tube in the bottom of one bucket back into the 1/4" tube and then into the main 1/2" line. Why? The siphon is "pointing" away from the 1/2" line towards the bottom of the bucket. It's a one-way force. Perhaps to be on the safe side, we should eliminate the optional "T" in the 1/4" line that feeds two buckets from the 1/2" line. If you're an expert in agriculture who appreciates the siphon's one-way force we would love an expert opinion. Thanks! from YouTube viewer "asanov" writing from Malaysia: The water refill pipe should be covered or capped. In tropical climates, the opening will invite female mosquitoes to breed and consequently diseases such as malaria or dengue could spread rapidly. Edward Borley writes: For capping tube ends, nylons (women's stockings) are a good choice. They won't degrade and one old pair that's already being thrown out will cap a lot of ends. This is where we buy float valves: US Plastic CorpMake sure you get the adjustable valve. We upgraded from the 1/4" to the 1/2" because during the summer the plants were drawing a lot of water from the yellow reservoir and it appeared that the 1/4" valve couldn't keep up with the demand. 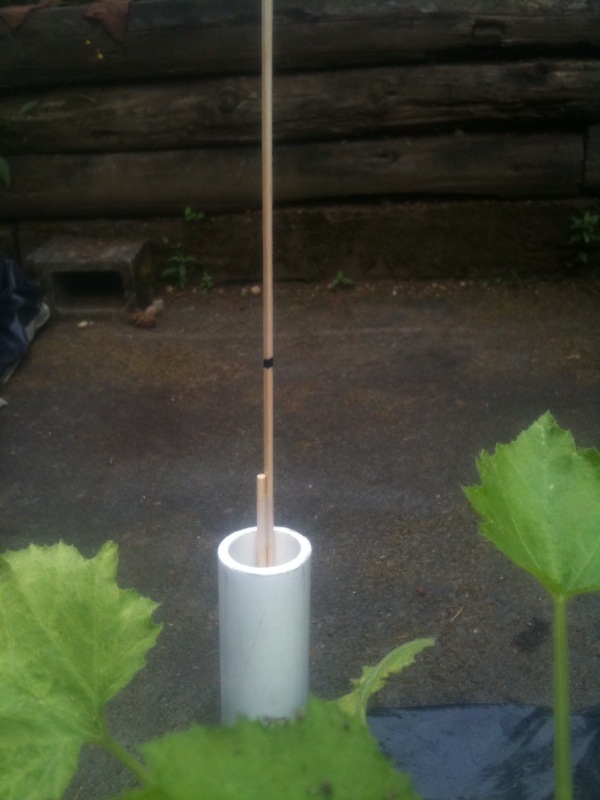 Randy Gilliland of Redmond, WA writes, I came up with a simple dipstick for the water tube so I can tell at a glance how much water is in each container. 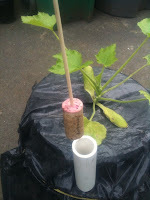 It's a wine cork on a rod made of taped up bamboo skewers. I put it in dry and with a marker I mark the skewer at the top of the filler tube once the bucket is full of water the cork rises and I can watch to see when I'm getting low. "Just so you know, the 'traditional' thinking has been that peat bogs take 10,000s years to form. I have seen college text books that teach this. However recent research has found that Sphagnum moss grows up to 30 inches tall each year. I own 150 acres of forestland which includes peat bog. I can harvest peat, and it does grow back. Allowing re-harvest every 8 years. If I remove a 3 foot thick layer of peat, and come back 8 years later I can do it again. Peat is a renewable resource. Northern Scotland, Ireland, and Finland have been performing renewable harvests of their peat bogs for about 30 years." Galen Young of Argyle, Maine. 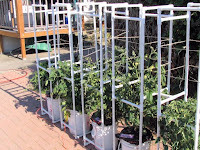 Mike Noel of Lewiston, Idaho sent us this picture of his PVC tomato cage. Click on it for a larger image. Please let us know where you've had success in getting free, recycled or really cheap buckets. 1) Bakeries. Frosting is shipped in buckets. These buckets are often smaller than 5 gallons, resulting in smaller water reservoirs. If you use the automatic watering system, you should be AOK. Wayne Burks from Anderson, Mo. writes, "I've been finding them at some Walmart stores that have bakeries. I get at least 5 at a time. Tonight I was able to get 9!" 2) Pickles. Deli pickles are often shipped in 5 gallon buckets. 3) Drywall Mud. According to Friedrich from Munich Germany, buckets that are used to ship drywall ("SheetRock") mud are safe. We express no opinion on the safety of using drywall mud buckets for a garden. Do not use them unless you have verified that they're safe. 4) Soap Makers. Make friends with a person who makes handcrafted soap. Vegetable oil, which is shipped in 6.5 gallon buckets, is used in the soap making process. 5) Mexican restaurants. I live near a Mexican restaurant which puts out their used buckets and lids weekly so this is a really good source. If you don't mind the fact that they are imprinted with the words Lard and Pork Bellies and of course you have to clean out the residual! I use the lard scrapings to make little eateries for the wild bird population in the winter. Sylvia from Norristown, Pennsylvania. 7) Electric motor rewinding shops get their wire in 5 gal. buckets. These are spotlessly clean and ready for use. They just junk them. Mike Connolly from Central Illinois. 11) Car Washes. I've recently discovered car washes, particularly the self serve car washes, have a large supply of buckets. The one near me has a never ending supply of 5, 30 and 55 gallon plastic buckets. Sam Aiello of New Jersey.